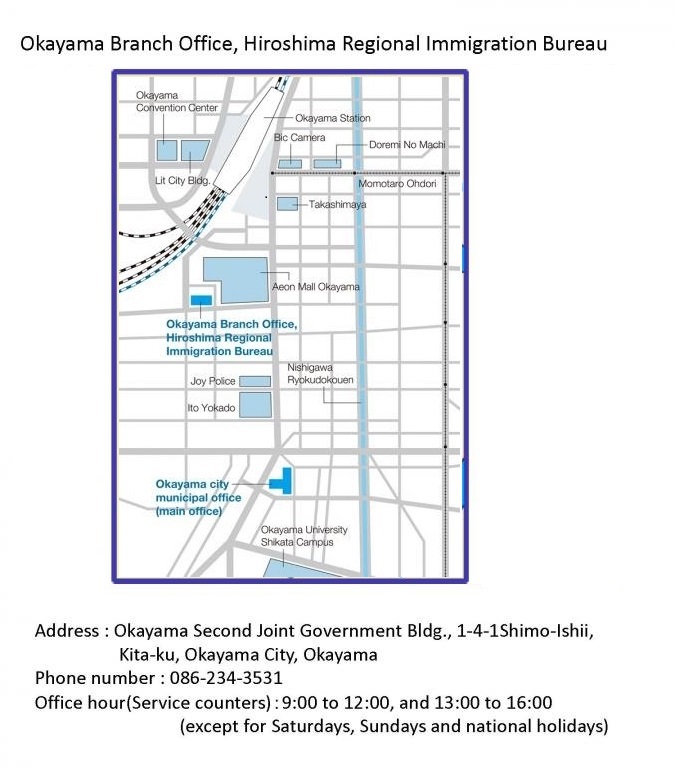 Please apply yourself at the Okayama branch of the Hiroshima immigration office. Applications are accepted from 3 months before the expiration of the Period of Stay. Foreign nationals in possession of a valid passport and resident card (or Alien registration certificate) who will be re-entering Japan within 1 year※ of their departure to continue their activities in Japan are not be required to apply for a re-entry permit. ※If your period of stay expires within 1 year after your departure, please ensure that you re-enter Japan before the expiration of your period of stay. Be sure to present your resident card at departure and indicate your intention of re-entering Japan. The "Out-of Status Activities Permit" is a necessary permit for those who want to do activities which earn income in addition to those activities designated for the original purpose of residing in Japan. In the case of international researchers who have "Professor" or "Research" visa and who are receiving income from activities other than those permitted by their status of residence, it is necessary to apply for a permit authorizing "out-of status activities". Visa holders who receive payment for activities not authorized under their visa classification are committing an illegal act. However, if a "Professor" or "Research" visa holder receives speaking fees for special lectures (lectures not held regularly) they do not need to ask for an "Out-of-Status Activities" permit.